One of the finest transient shapers we've seen/heard, TransReckon works wonders on drums and other transient-heavy sounds. Easy to use. Versatile dynamics control. Unlink stereo channels. Useful 'listen' function. Parallel processing. Built-in brickwall limiter. TransReckon is described by eaReckon as a "transient processor", and it falls into the category of dynamics processor that you will have previously seen referred to as a transient or envelope designer, shaper or modulator. Such tools are pretty commonplace (and included with most DAWs these days) but perhaps less appreciated or understood than their distant cousins, compressors. TransReckon's operation is centred on two main knobs, Attack and Sustain, the first of which is turned up or down to increase or decrease the amplitude level of the transient peaks in a signal. "TransReckon is a beautifully realised dynamics processor"
It's supremely easy to put TransReckon to work adding definition to any percussive part: simply push the Attack knob up and you'll hear even its quieter transients start to leap out. Conversely, lowering the Attack does a great job of softening harsh, spiky transients that might be too forward in the mix. You can do something similar with a limiter or compressor, but TransReckon (like any transient shaper) works its magic without the use of a static, fixed threshold control. The effect instead detects transients by measuring the rate and amount of level increases, so the detection algorithm is capable of latching on to all transients (depending on the Sensitivity knob settings), no matter what their absolute levels. The Sustain knob determines how much the post-transient decay is boosted or attenuated, letting you increase or decrease the tail level of drums, guitars, basses and other percussive or 'plucky' sounds. So far, it's all standard transient shaping fare, then. One control that sets TransReckon apart from most of the competition, though, is the Length knob, of which there are two: one each in the Attack and Sustain sections. 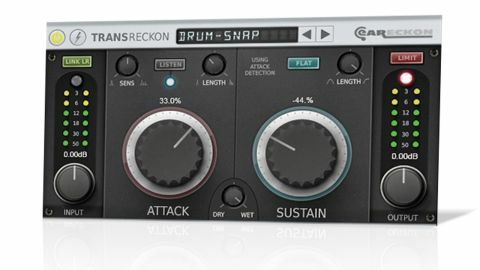 The Attack Length increases or reduces the duration of the transient processing, enabling you to dial in anything from massive, meaty impact (using a long Length) to delicate, refined transient snap (short Length). The Sustain Length does the same, but targeting the effect for the tail. This works particularly well on drum overheads, being quite similar to heavy compression, but sounding different in that every hit becomes big and explosive - again, because there's no fixed threshold. Another 'non-standard' setting is the Link LR button. When this is deactivated, TransReckon works on the left and right channels independently - eg, for softening transients on just one side. TransReckon also features a Dry/Wet mix knob, so you can pull in some of the dry signal to keep things under control or achieve results similar to parallel compression. And, as you'd hope, there's a built-in brickwall limiter, too, for preventing excessively loud transients jumping wildly into clipping category. TransReckon is a beautifully realised dynamics processor that gives you the ability to get into the nitty gritty of your transients and process percussive material in ways that you just can't using other tools. It works well, it's easy to put into action and it sounds fantastic. You can quite easily go too far with it, and it won't replace your favourite compressor, but when you need a high level of transient control, it's a definite winner.